Lampropeltis triangulum is a non venomous colubrid species. They have smooth and shiny scales. Their dorsal color pattern is narrow bands of white and black, alternated with brownish dorsal saddles. The dorsal saddles are sometimes reddish or reddish brown in the southern areas of their range. The pattern on the top and sides of the snake has also been described as three (or possibly five) series of black-bordered brown (reddish brown sometimes) blotches along the length of the snake on a gray or tan ground. Lampropeltis triangulum can be housed in an enclosure of 0.9 x 0.45 x 0.45 meters (3 x 1.5 x 1.5 feet) depending on the subspecies but bigger is always better if you decorate your enclosures properly. Hatchlings should always be started out in smaller tanks or tubs for ease of feeding and care. You can decorate your enclosure with logs and foliage to offer more security and make your enclosure more naturalistic. Hide boxes should be used in tank set ups. Hides can be anything from paper tubes, hollow logs or ready made hides. An additional hide can be used as a humidity hide for help during shedding period. Aspen shavings are the most popular substrate for Milks. Other options are natural soils and kiln dried pine. A heat pad on one side of the tank reaching the hot spot of 26-27 °C (78-80 °F) will allow the snake to regulate temperature as needed. Ambient temperature for Lampropeltis triangulum should be around 21-24 °C (70-75 °F). Fresh clean water is a must. Filtered is always the best. Water bowls should be kept clean and an occasional cleaning in the dishwasher to sterilize is good. Milks tend to soil their water bowls especially after feeding. They will also use the water bowls for pre shed if a humid hide is not provided. High humidity is not recommended for Lampropeltis triangulum. It’s best to keep the enclosure dry, around 40-50% with only a humid hide available to them. High humidity will cause mold in most of the recommended substrate. 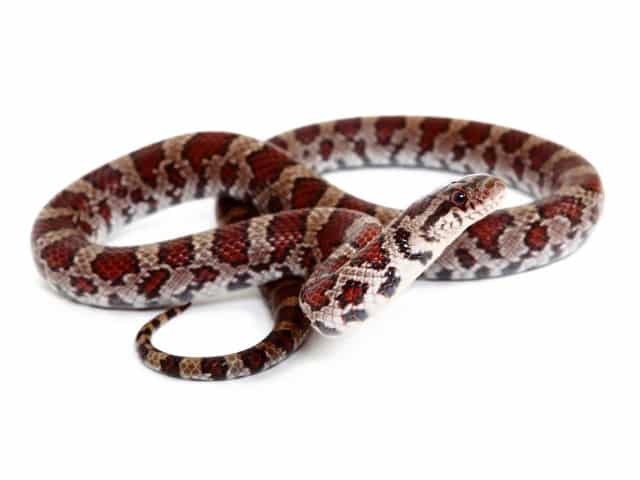 Lampropeltis triangulum will take mice as their primary diet, from pinkie to adult. Most will start off on live or frozen thawed pinky mice with no issues. Some will need scenting with lizards. Smaller species can be difficult to start on mice and will only take lizards. Hatchlings of smaller North American milks can be extremely difficult to start. These should only be for the experienced keeper. Some will need to be assist fed with mouse tails while others will take only hatchling lizards. Once a week feedings are plenty to maintain good health. One to two per feeding depending on size fed. Younger Lampropeltis triangulum are generally hyper and can take a few months to settle down for ease of handling. As they age they calm down considerably and become much easier to handle. 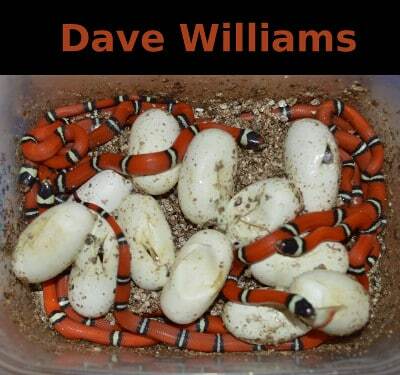 As adults they make great display snakes and for seminars at schools or shows. The variety and colors make them one of the best display snakes and a favorite at any event. Spot cleaning every few days is best to keep the enclosure clean and help with any fly or parasite issues. A complete clean and wash of the enclosure is good every month to help keep any possible infestation in check especially with larger collections. With a large enough water bowl or a humid hide, shedding should be a complete one piece shed. Issues from an incomplete shed can be stuck eye caps and tail sections. Stuck eye caps can lead to vision problems and tail sections can cause a loss of the tail section. For shed issues a warm water bath and help to remove the shed is best. Some eye caps can be removed carefully with scotch tape making sure you don’t stick anything else but the eye cap. Lampropeltis triangulum are hardy snakes and unless parasites or other diseases are introduced they should live a long life up to 25 years. Best bet is to get only captive bred from a reputable breeder.